Anna (Janet Montgomery) and Mercier (David Tennant). © Fresh Pictures / Robert Palka. 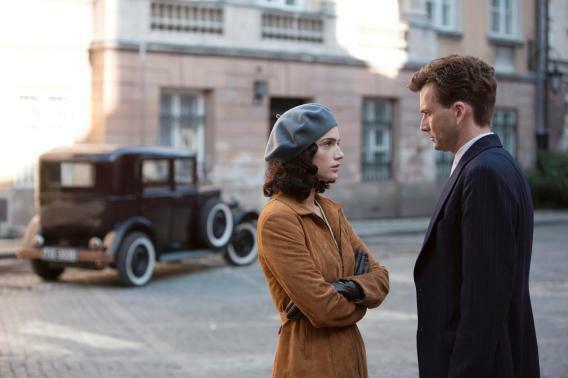 If you like the novels of Alan Furst, the acting of “Tenth Doctor” David Tennant, beautifully filmed historical thrillers set in pre-war Poland, formal wear, uniforms, old cars, and people speaking in slightly hard-to-understand Middle European accents—then you’ll enjoy Spies of Warsaw. The two-part miniseries, which premieres on BBC America at 9 p.m. tonight, is an engrossing, if slow-moving, drama set in 1937, about Jean-Francois Mercier, a French cultural attaché based in Warsaw, who is not-so-secretly spying on the Germans as they prepare for war. Clement and La Frenais’ early work can be hard to come by in the United States, but it’s well worth seeking out. The Likely Lads is especially tricky, since, astonishingly, only eight of the 20 episodes were preserved, but you can find entire episodes of The Likely Lads and Whatever Happened to the Likely Lads? on YouTube. Porridge is on Amazon Instant Video, and Lovejoy and Auf Wiedersehen, Pet are on U.S.-region DVDs. While almost all Clement and La Frenais’ sitcoms had working-class settings very different from the ballrooms and posh restaurants of Spies of Warsaw, they share one important commonality: Most were focused on men without women. The Likely Lads wanted girlfriends, but finding and keeping them was their biggest headache. Porridge’s Slade Prison was male-only space, and the guys of Auf Wiedersehen, Pet were working far from their wives and girlfriends. The Spies of Warsaw isn’t female-free, but Jean-Francois Mercier is a total romantic who spends much of the show falling in love and pining for his soul mate. It’s inspiring to see such experienced writers finding new ways to explore their most enduring themes. And it’s even more inspiring when the result is so good.